FFVII is known for its main protagonist Cloud Strife, but he wasn't as big as he was in Crisis Core. There the protagonist is Zack Fair, a second class SOLDIER (elite fighting force of Shinra Electric Power Company) with a positive attitude who dreams of becoming a hero and first class SOLDIER. He idolises first class SOLDIER Sephiroth, who was a good guy before he turned bad. Anyway one day Zack is ordered by Director Lazzard(?) to go look for first class SOLDIER Genesis who seems to have disappeared for some reason. He goes with his mentor and friend Angeal who disappears during the mission. Sephiroth helps Zack out since Angeal and Genesis are his friends. Zack finds things out such as S cells, Jenova and what have you, and meets Cloud who dreams of becoming SOLDIER. The two become friends. Sephiroth ends up turning evil when he learns of his origins in Niebelheim, Cloud's hometown. Some other stuff happens and Zack and Cloud are eventually caught and injected with mako (Zack was already injected with mako). Five years later and the two are able to escape the lab which is run by Professor Hojo. Cloud is pretty much unconscious due to an overdose of mako so Zack has to carry him around whilst trying to fight and defend themselves from SOLDIER who have turned against them. Okay so I have pretty much given the whole story of the Last Order, but oh well. The latter half of Crisis Core takes place here, with Zack and Cloud running away from the lower class SOLDIER whilst the Turks are also chasing after them. But what happens before that is mixed in with it too, which is a turning point in Crisis Core and provides a flashback of how the duo got into the situation they are in. Sephiroth learns of his origin and turns evil, causing havoc in Niebelheim as a result. Tifa declares her hatred for all things SOLDIER and we see that Cloud is stronger than he turns out to be when Sephiroth fights him and Zack. The two are unconscious after this fight, allowing Professor Hojo to take them as test subjects. Then it moves back to the present as the two are travelling to Midgar before they are ambushed by SOLDIER. Sadly that's where it ends, and to find out what happens next you can either play through Crisis Core or check out the ending on YouTube. 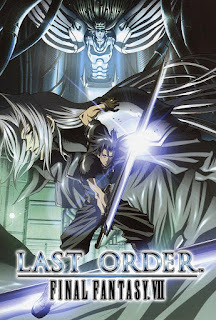 Last Order: Final Fantasy VII is a great anime version of the events which occur in the latter half of Crisis Core before Cloud takes the limelight, also showing how Cloud, Tifa and Sephiroth become the people they are in the main game. Of course there are some differences in the timeline of the anime given the flashback of the events before moving back to Zack and Cloud's current situation but the story delivery is really good even though it ends on a cliffhanger.